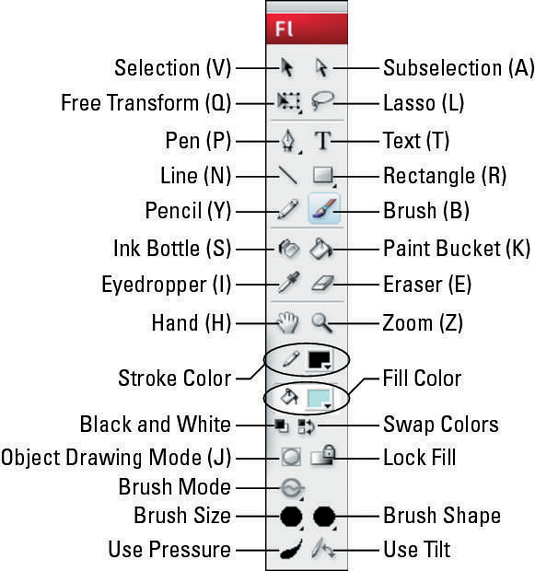 The Tools panel in Flash CS3 contains all the drawing tools as well as many editing tools. You’ll use this panel a lot! Most drawing tools have their own modifiers that control how the drawing tool works. In the image below, you see only one set of modifiers — the ones for the Brush tool. Other tools offer different modifiers, so the options section of the Tools panel will look different depending on the tool you’re using. Several buttons have flyouts, which are like submenus for toolbars. You click a tiny arrow at the lower-right corner of the button to display additional tools. For example, the Rectangle flyout reveals the Oval tool, the Rectangle Primitive tool, the Oval Primitive tool, and the PolyStar tool. Note: Shortcuts for each tool appear in parentheses.